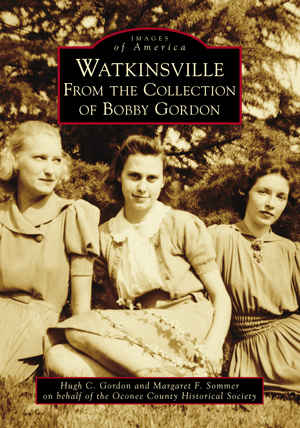 The city of Watkinsville was founded in 1801. By 1819, there were two churches, two hotels, three stores, and a score of dwellings. The arrival of the Central of Georgia Railway in 1888 and the fact that Watkinsville is the county seat helped the city grow. By 1940, the population was 558. The community had grown to include two more churches, a high school, a radio shop, a hardware store, a gas station, a café, several general stores, a beauty shop, and a drugstore with a soda fountain. The photographs in this book are part of the Bobby Gordon Collection and were taken during the late 1930s and early 1940s. Robert Sydney Gordon was born on August 19, 1923. As a teenager, he became interested in photography and obtained a used camera. He grew up in Watkinsville, graduated from the University of Georgia with a degree in business administration, and served during World War II as a radio operator with the 106th Cavalry. Hugh C. Gordon, Bobby’s nephew, worked to digitize the photographs and presented copies to Oconee County Historical Society, the sponsor of this project. Margaret F. Sommer has a degree in history from Ohio State University and is the editor of The History of Oconee County, Georgia.